Of all in need of kindly alms. And he as steward knew them well". The Acts of the Apostles reports that deacons were ordained for the daily diakonia, the distribution of food and alms to the poor, and this was evidently the case for Saint Lawrence of Rome. This verse by Prudentius celebrates the ministry of Saint Lawrence, and in this holy time of Lenten almsgiving, we do well to look to him as our patron and exemplar. Indeed, St Lawrence's popularity - and the many churches in Rome built in his honour, his legends, songs, and sacred art all testify to this - is due to his tremendous charity, and concern for the poor. In the Eucharist Jesus also makes us witnesses of God's compassion towards all our brothers and sisters. The eucharistic mystery thus gives rise to a service of charity towards neighbour, which "consists in the very fact that, in God and with God, I love even the person whom I do not like or even know. This can only take place on the basis of an intimate encounter with God, an encounter which has become a communion of will, affecting even my feelings. Then I learn to look on this other person not simply with my eyes and my feelings, but from the perspective of Jesus Christ." In all those I meet, I recognize brothers or sisters for whom the Lord gave his life, loving them "to the end" (Jn 13:1). Our communities, when they celebrate the Eucharist, must become ever more conscious that the sacrifice of Christ is for all, and that the Eucharist thus compels all who believe in him to become "bread that is broken" for others, and to work for the building of a more just and fraternal world. Keeping in mind the multiplication of the loaves and fishes, we need to realize that Christ continues today to exhort his disciples to become personally engaged: "You yourselves, give them something to eat" (Mt 14:16). Each of us is truly called, together with Jesus, to be bread broken for the life of the world. In fact, the patriarchal basilica of St Lawrence outside the Walls is an unusual building; an example of 13th-century church re-orientation even! 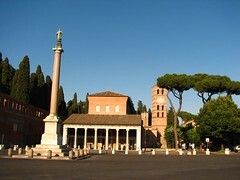 A Constantinian basilica had been built on the site of St Lawrence the deacon's burial. 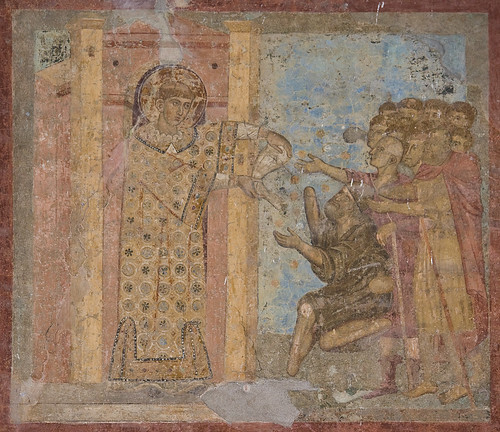 In 579, Pope Pelagius II built a new church adjacent to the basilica (which no longer survives), but most of what one sees today is yet another church, built by Pope Honorius III in 1216. In a tremendous work of re-building, he demolished the apse of the 6th-century church, and completely re-orientated the new church so that the narthex of the 13th-century church stands on top of the former apse. He then converted the narthex of the 6th-century church into a lower-level crypt, where the shrine of Blessed Pius IX is now. In front of this he placed the tomb of St Lawrence, and raised the level of the new prebyterium or chancel by nine steps to create a 'confessio' under the repositioned Altar with its graceful baldachino.